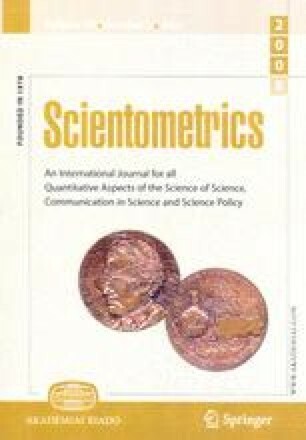 This article proposed a new index, so-called “Article-Count Impact Factor” (ACIF) for evaluating journal quality in light of citation behaviour in comparison with the ISI journal impact factors. The ACIF index was the ratio of the number of articles that were cited in the current year to the source items published in that journal during the previous two years. In this work, we used 171 journal titles in materials categories published in the years of 2001–2004 in international journals indexed in the Science Citation Index Expanded (SCI) database as data source. It was found that ACIF index could be used as an alternative tool in assessing the journal quality, particularly in the case where the assessed journals had the same (equal or similar) JIF values. The experimental results suggested that the higher the ACIF value, the more the number of articles being cited. The changes in ACIF values were more dependent on the JIF values rather than the total number of articles. Polymer Science had the greatest ACIF values, suggesting that the articles in Polymer Science had greater “citation per article” than those in Metallurgical Engineering and Ceramics. It was also suggested that in order to increase a JIF value of 1.000, Ceramics category required more articles to be cited as compared to Metallurgical Engineering and Polymer Science categories.